I started backpacking in 1995 when I moved to Washington State. Since then, I have backpacked in all seasons and conditions the Northwest has to offer. I prefer trips on rugged trails with plenty of elevation gain. While I continuously strive to lighten my load, comfort and safety are most important to me. I have finally managed to get my basic cold weather pack weight, not including consumables, to under 30 lb (14 kg). The Puff Doggy is in essence a belay jacket for dogs. “Just like your puffer jacket the Puff Doggy is designed to keep your warm when you’re chillin’ out.” Originally designed for avalanche crews, the jacket is generous in size, made from two different weights of “down-alternative” insulation (100 & 200g) arranged to provide more insulation to key areas (spine, hips, shoulders, and chest) in a Pertex shell. The jacket is intended to provide maximum warmth and coverage while minimizing bulk and it packs down into its own built in pouch. Before joining our family Meg was apparently abused and abandoned. Best we can tell she is a chocolate lab and terrier mix and the vet estimates she was born around April 2016. Her chest is about 33" (84cm), belly 25" (64cm) and from base of neck to tail 21" (53cm). Weight about 79lbs (32kg). She has short dark brown fur with some white spots. She is almost all muscle and bone (the vet has described her as "freakishly strong"), overheats in the heat/sun very easily, and has very bad hip dysplasia. Despite her size and sometimes intimidating looks, she is one of the most cuddly and lovable dogs I have ever met, and really seems to love children (and for some reason our cat, who seems to hate and torment her at every opportunity). To start off I love the name “Stunt Puppy” and as we have a running joke that Meg’s rapper name would be “the notorious D.O.G.” so the jacket being called “Puff Doggy” seems fitting. Meg has short thin fur and (unlike me) very little body fat, so she is not especially suited to our northwest winter conditions. She wears a coat when it is especially cold and raining/snowing. 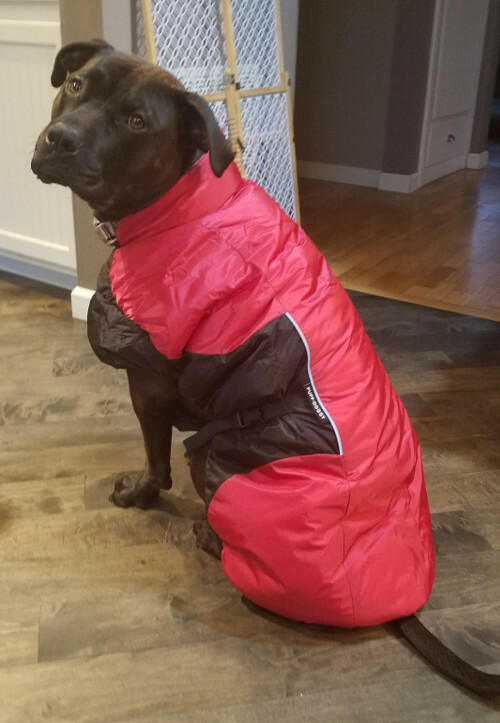 I also have her wear her coat to sleep in when we camp as she is not good at staying under covers and does not fit in my sleeping bag (but she really really wants to). The Puff Doggy is available in two colors [sage/black, red/black]. We received the red (our preferred color). It also comes in 7 sizes [MINI, XXS, XS, S, M, L, XL]. Based on Meg’s size and weight (the manufacturer's site has a detailed fitting chart) we chose the L (large) size which seems a little large for her but I would rather it be a bit large than too small. The front reflective detail as well as the tail and one back leg loop can be seen in the attached photo. The jacket shell is smooth and soft, what I would consider a medium weight shell if it were one of my down jackets. 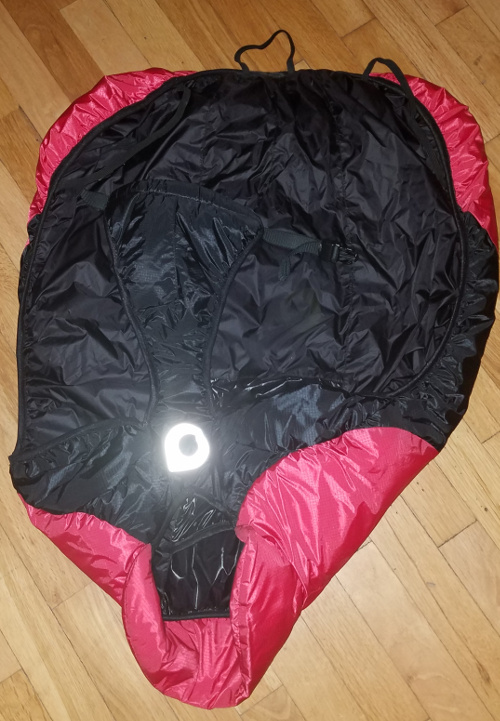 I would mention that the manufacturer states this jacket is focused on lightweight warmth and not intended for activities like running through the brush, so it is very much like my own lightweight puffy jackets. It has an extended collar around the back of the neck and reflective details: two strips on the sides and the Stunt Puppy logo on the chest. The jacket slips on over Meg’s head and is secured under her belly by way of two secure side-release Duraflex buckles that are on the ends of elastic straps (nice detail). The buckles are adjustable and have a locking mechanism to hold them in place on the straps. There are also elastic loops for her back legs and tail so that the coat remains in place. It looks as if using the back leg and tail straps could be optional depending on activity and need. Getting the jacket on for the first time was quite easy, in fact easier than her other jacket and most of her harnesses. Once on she did not seem to notice it, but she is used to wearing jackets and harnesses so I am not sure how typical she is in this regard. One of the design features mentioned by the manufacturer is “There are no straight lines on a dog, so there are no straight lines on a Stunt Puppy”, and based on the initial fitting I would say this jacket fits well. One additional feature of the Puff Doggy is the built-in stuff sack. 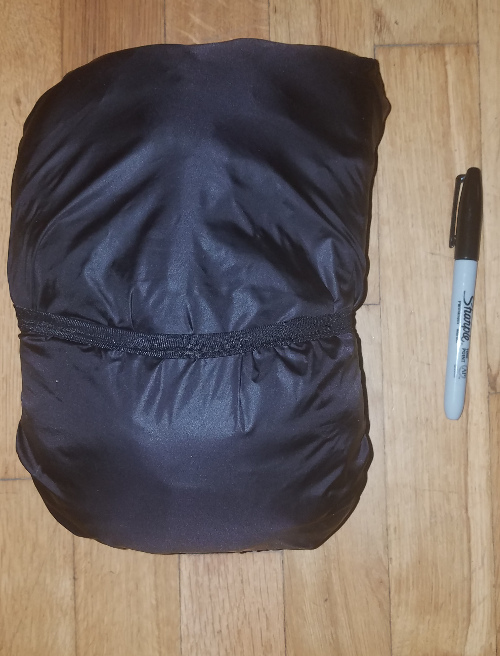 There is a pocket sewn inside the jacket at the neck that when turned inside out becomes a storage pocket for the jacket. Stunt Puppy touts the product as being well constructed and durable with features like bar tack stitching as used in climbing gear, performance fabrics; “We make our gear with the same fabrics you’ll find in your own favorite stuff”, and “when it comes to buckles, we don’t mess around: We use the best ones on the market”. Given that Meg has been described by her vet as being “freakishly strong” I appreciate that level of construction (and we just might put its strength to the test). Initial inspection of the Puff Doggy suggests it is quite well constructed and I could find no obvious flaws. As for Likes/Dislikes, I would say I really like the fit, east of getting on/off and lightweight warmth, not to mention the attractive color and reflective details. The slide-release buckles seem to come loose easily (have to readjust each time I put it on her) and I wish there was an opening on the back of the neck for me to attach the lead to her collar. Since the Initial Report Yakima has experienced some record cold and record snow falls (sadly in the valleys, not in the mountains where we really need it). 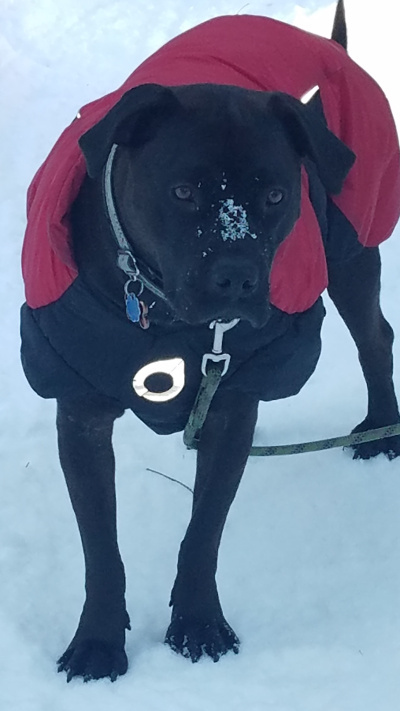 We had the opportunity to use the coat on some of our daily walks at home (Yakima Washington) as well as while on a trip to Bend Oregon when temperatures were well below freezing and there was wind and snow. While in Bend we also found an amazing dog park and let Meg run around for a bit. While there she found another dog to roughhouse with and before I knew it the other dog had a mouth full of the coat and was attempting to wrestle Meg to the ground with it. I managed to get the coat off of her so she could continue to play unhindered and was expecting a large tear where the dog had chomped down on the coat, but I was amazed to find the coat was totally undamaged?!?! So the coat seems to be far less fragile than it would initially appear! Our cleaning person does not like to have Meg in the house, so on Thursdays (Cleaning Day) she spends most of the day outside in our back yard. At the beginning of the test, I would have her wear her old coat as I worried she would do something (like crawl under the deck) that might damage the Puff Doggy coat, but after seeing how tough it really is the last two cold Thursdays I put her out with the Puff Doggy coat and not only did she not damage it, I had a little less stress that she might be cold while out (I don’t recall the specific weather but do recall they were colder than normal days and snow in the yard was up to my knees). 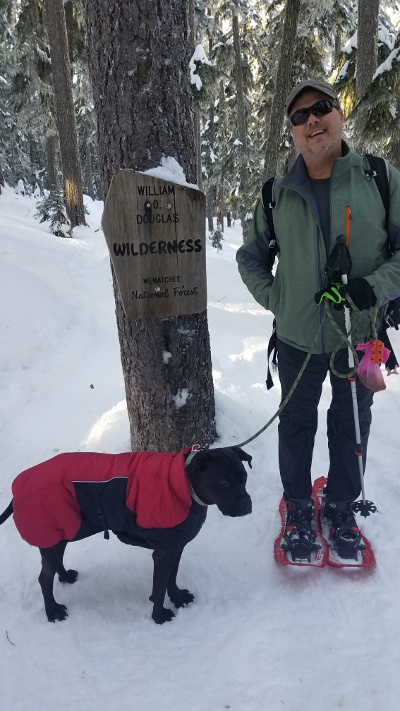 For our one and only overnight trip, we did a short trip on a trail in a sheltered valley that I like to use for early season “shake down” trips and/or to try out new gear. While this area was at least not as frigidly cold as most any other place we could have gone (above freezing during the day and just below at night), the warmer temperatures meant a muddy trail. Meg wore the coat to sleep in. Note to self: Dog + muddy trail + tent = dirty sleeping bag. As for fit, it seems to fit her quite well, no rubbing nor binding. The rear leg and tail loops help to keep the coat in place when she is moving about as well as allowing it to wrap around her when she curls up to sleep, but does not hinder her movements, and yes I also mean movements in the literal as well as the euphemistic sense. So far the buckles have not slipped or moved during use as I had originally anticipated and their ease of adjustment more than makes up for having to adjust them each time I put it on her. I also have found the lack of an opening for her leash as mentioned in the Initial Report has not been an issue so I am going to retract that as a dislike. When it comes to insulation…well…obviously Meg can’t tell me how warm/cold she is but my impression from how she acts is that the coat provides a significant level of insulation and she seems quite comfortable when she has curled up to sleep or nap while wearing it. As for likes and dislikes, I would echo the likes from the IR, add durability to the likes, and say I no longer have any dislikes. This concludes my Field Report. I invite you to return in 2 months for the next installment. I would like to thank the folks at Stunt Puppy and BackpackGearTest.org for the opportunity to test this product.